The Prendergast Library has 2 computers labs, 3 desktop scanners, a copy machine and fax available for public use, along with free WiFi available when the library is open. The library has 15 computers available for public use. A valid library card is needed to sign up and use the computers on an hourly basis. If you do not have a library card, please see the Information Desk or Circulation Desk. Times may be extended if there is no waiting list. Computers are available as soon as the library opens and all sessions end 15 minutes before the library closes. All computers are able to access the Internet, electronic databases, library catalogs and have Microsoft Office programs installed on them. There is a flatbed scanner available in the lab – just choose that option when signing up for a computer. Users of library computers requires acceptance to abide by the library’s Internet Use Policy. Free WiFi is available during the hours the library is open. To connect to the wireless network our Wireless access points located in the library communicate with your wireless device. Our wireless network is called “Prendergast.” You should be able to connect anywhere in the library. When your wireless network card senses a signal, a message appears on the screen indicating a wireless network is available. Open your web browser and it will automatically connect to the Internet. When connecting to the Internet you are agreeing to abide by our Internet Use Policy. Whether you live in Jamestown, travel here on business or even if you are visiting, there is no need to wait for one of our Public Computers to become available. Just turn your wireless enabled laptop on and it will find our network, no configuration is necessary. Printing is not available from the wireless network. You can save the information to a disk for printing at home, or send an email to yourself, then sign up for a public computer and print from there. 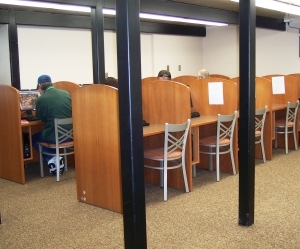 The library also has a Public Computer Center (PCC) with 16 public computers, 2 flatbed scanners, a high speed printer and videoconferencing unit; funding for which was provided through the American Reinvestment and Recovery Act (ARRA) Broadband Technology Opportunities Program. The purpose of the PCC is to provide technical support and other resources to assist with job searching and career advancement for the unemployed and underemployed. 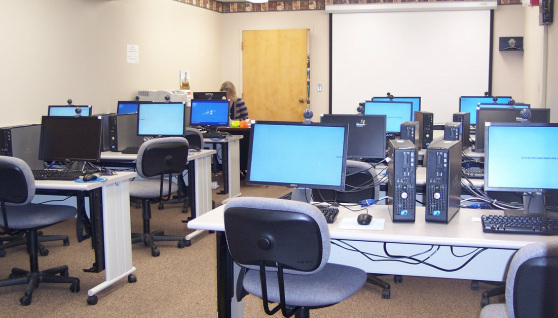 The library provides a variety of classes, career databases, employment assistance and computer use, at no cost, for those wishing to improve job related and technical skills. Please see the library events calendar for a class subjects and times. The Library also offers access to laser printers for computer users. Documents sent to the printer from Internet computers will remain available for printing for up to twenty-four hours after they have been sent. The copy machine is located in the Public Internet Lab. Black & white copies are .15 per page, Color copies are .50 per page.